The new 12-track recorder simplifies music creation with built-in overdubbing, effects, and other musician-centric tools. The musician features will also be available for purchase as a plugin for the MixPre-6 and MixPre-10T. 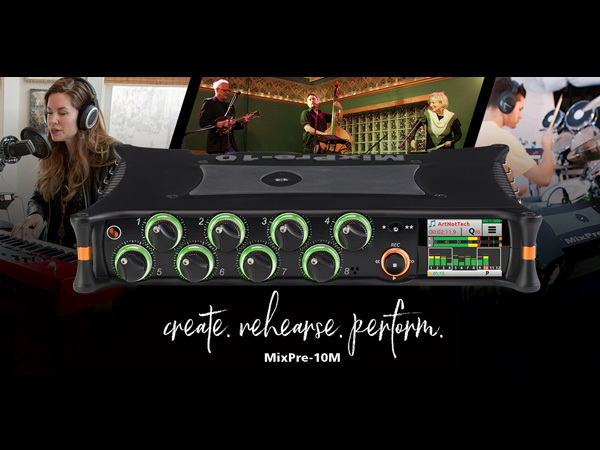 REEDSBURG, WI USA, MARCH 7, 2018 – Sound Devices is thrilled to introduce the MixPre-10M, a lightweight, ultra-portable multitrack audio recorder designed specifically for musicians and songwriters. The first-of-its-kind, the MixPre-10M is a 10-input/12-track recorder, mixer and USB audio interface that offers a suite of musician-focused features including overdub, reverb, and metronome. Ideal for song creation and live performance, the user-friendly MixPre-10M acts as a high-performance portable studio for musicians to capture their songs and ideas anytime and anywhere inspiration grabs them. Incorporating the core functionality of a Digital Audio Workstation (DAW), the MixPre-10M is intentionally simplified to allow musicians to focus on creating songs without letting technology get in the way. The MixPre-10M is the newest member of the award-winning MixPre Series (MixPre-3, MixPre-6 & MixPre-10T) of audio recorders, mixers, and USB audio interfaces.